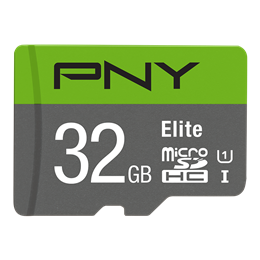 Unlock the potential of your mobile devices with the PNY 32GB microSD card with OTG reader. It features 32GB of storage, a case-friendly micro USB connector and USB 2.0 Type A, for convenient storage and sharing across devices including PC and Mac computers, Android smartphones and tablets, action cameras, drones and more. U1 Technology is perfect for Full HD Video Recording and HD photography, allowing you to capture high-quality HD video and images with your mobile technology. The Elite microSD card is rated Class 10, U1, delivering fast transfer speeds of up to 85MB/s so you can share content at lightning fast speeds while on the go.